Controlling weeds can be frustrating when you’re just starting to garden. Weeds are so tough and fast-growing they can easily out-grow desirable plants if you don’t take charge. You can be forgiven for thinking that weeds are unwelcome garden guests invited by nature to drive you crazy. Not quite: nature doesn’t like bare soil and has an arsenal of fast-growing, opportunistic plants that colonize bare soil quickly. The trouble is that most of them aren’t plants you want in the garden because they can easily take over. Weeds are a phenomenon of disturbed soil. Their seeds lie dormant in the soil, waiting for the right conditions to germinate. When they’re buried several inches deep, there isn’t enough light for germination, but as soon as you dig up the soil, their seeds come to the surface and sprout. The first step to controlling weeds is figuring out which are the weeds and which are the garden plants. This can be a challenge in early spring, when they can look alike to the novice. However, weeds tend to grow and green up before many garden perennials get going, and most produce tiny flowers that bloom and go to seed quickly. Weedy plants also tend to have somewhat ‘weedy’ odor, so breaking of a piece of stem and sniffing it can give you a clue. If you’re worried about pulling out the flowers, once you spend time in the garden getting to know what your plants look like, distinguishing them from weeds gets easier. If you pull up something that has potting soil around the roots, it’s likely a garden plant. First, avoid planting into weedy beds. Remove weeds before they go to seed. Don’t leave bare soil: Cover it with desirable plants and mulch in between them so weeds have fewer opportunities to get a toehold. 1. 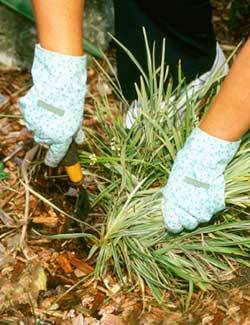 Do a thorough job of getting rid of grasses and perennial weeds before you plant. Never just roto-till a weedy or grassy area and plant directly into it because grass and perennial weeds can re-grow from small pieces of root or stem left in the ground, as well as seeds. It’s best to remove sod and then turn the soil over with a digging fork, breaking up the clods of soil and removing all the roots you find. More tips on how to prepare a garden bed. 2. Alternatively, herbicides such as Roundup can be used for controlling garden weeds. Use these products carefully, following package directions and don’t allow the spray to drift onto desirable plants. (More than one treatment may be required.) A herbicide applicator with a sponge such as the Weedeezy ensures that you only use the smallest amount possible and you have no spray drift. 3. Organic weed controls to ‘burn’ foliage. New organic products for weed control are coming on the market, such as soap-based Weed-Aside Herbicidal Soap, and Nature’s Avenger Organic Herbicide, a natural citrus oil based herbicide that kills broadleaf weeds and crab grass naturally and quickly. 4. Solarize weeds. A non-chemical way of controlling weeds and grass is by laying black plastic over the ground to kill them off. However, this can take up to a year to be effective if there are a lot of perennial weeds. 5. When you see a weed, remove it – now. It’s easier to pull or hoe out small weeds than big deep rooted ones. Don’t allow weeds go to seed and don’t add weed seeds to your compost. Weeds are easier to remove when the soil is moist. 6. Keep grass clippings away from garden beds. Lawn grass forms lots of seeds during certain times of the year, so don’t shoot clippings into your beds when mowing. 7. Use mulch for controlling weeds over the long term. Layer 2 to 3 inches of mulch over bare soil between plants. Commonly available mulches are straw (not hay – too many weed seeds), cocoa bean hulls or shredded cedar bark. Mulch keeps weeds down, mainly by blocking out the light their seeds need to germinate. If a weed does manage to poke through, it’s easier to pull it out when rooted in mulch than when well anchored in the soil. More on mulch for controlling weeds. 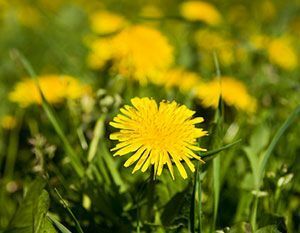 Perennial weeds such as dandelions, Canada thistle, quack grass and creeping Charlie are long-lived and have large, vigorous root systems. Many of them spread by seeds, stolons (horizontal above-ground shoots), or rhizomatous roots (underground horizontal stems that produce spreading roots and shoots) that develop into new plants making the patch ever bigger. They are the toughest weeds to get rid of because of their ability to re-grow from pieces of root. Summer annual weeds such as lamb’s quarters and ragweed sprout in spring and go to seed in late summer and fall. Winter annuals such as chickweed sprout in fall, live over winter, and go to seed in spring or early summer. Controlling weeds is important with the annual types because they can grow quickly enough to spawn a couple of generations in a single season if allowed to go to seed. Biennial weeds such as Queen Anne’s lace and burdock form roots and a rosette of leaves the first year, then flower and set seed the second year.